Took me a few weeks but finally writing about running my second marathon! 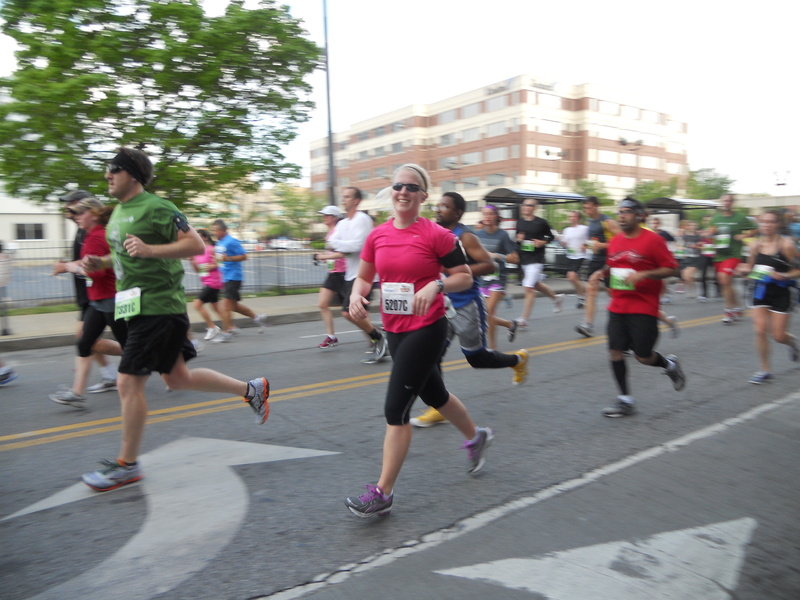 I ran the Kentucky Derby Festival Marathon on Saturday (April 28) and it went fairly well being my second marathon and first marathon/major race not sleeping at home the night before. I was a little caught off guard with how many hills there were, especially in the last few miles, so I did not get a new PR but I finished! On Friday (April 27) morning my Mom and I drove to Louisville which is about a 3 hour drive for us. Of course we could not resist a quick stop at Ikea on way so ended up arriving at the marathon expo a little before 2pm. The expo was very similar to all the expos I have been to before however I was not pleased that they had already ran out of safety pins for the bibs. They still had seven hours left in the expo and they had ran out of safety pins already. I usually bring my little Tupperware container full of safety pins from previous races but of course forgot it this time. It was just the principle of the thing that annoyed me, obviously I can afford my own safety pins. After the expo we headed out just to get a feel of the marathon route downtown so my Mom had an idea of where she was going in the morning during the race. Louisville seemed to have a pretty nice downtown from what I saw during the race and the day before. I actually I wished I had more time to spend there. The few days leading up to the marathon the forecast was about 30% or 40% chance of thunderstorms but it turned out to be a beautiful morning. Actually so sunny and clear skies by noon that I had a few issues with it being so hot and sunny during the last few miles. We were not expecting that! I will say their start was pretty much like every other race I have been to except for hearing the Kentucky Derby “song” right before we started and having two helicopters hovering waiting for us to start. Surprisingly right before I started both marathons I never really thought about truly running 26.2 in the next few hours. I was just ready to start running and focused on getting through the distance I knew for sure I could run. My mental strategy is to focus on about the first eight or ten miles and then at that point I have less than 18 miles left (which I had ran before the marathon) and just try to convince myself I didn’t just run 10 miles. Sometimes it takes a lot of convincing. Back to the actual marathon. I started out at about a 9 minute mile pace and was able to keep it for about first 15 miles of the race until I started feeling lightheaded. I had to stop and walk a few times to get the lightheadedness to stop but seemed to go away after I passed about the 21 mile mark. There were a lot of hills on this course right in the middle and also between 21-25 miles. The rest of the course was pretty flat. It was really hard at times to push through this one because of all the hills and of course the lightheadedness, I was scared at times that I was over doing it and might pass out. I passed a few medical tents as I was running and considered even stopping once or twice but just got to the point I didn’t care about my time anymore and just wanted to finish. The lightheadedness and last few miles of hills made it pretty hard mentally to complete this one but I knew I wanted to finish for all my family, friends, and MSers who were cheering me on. (And of course for myself.) Knowing you guys were pulling for me really pushed me on so thank you! 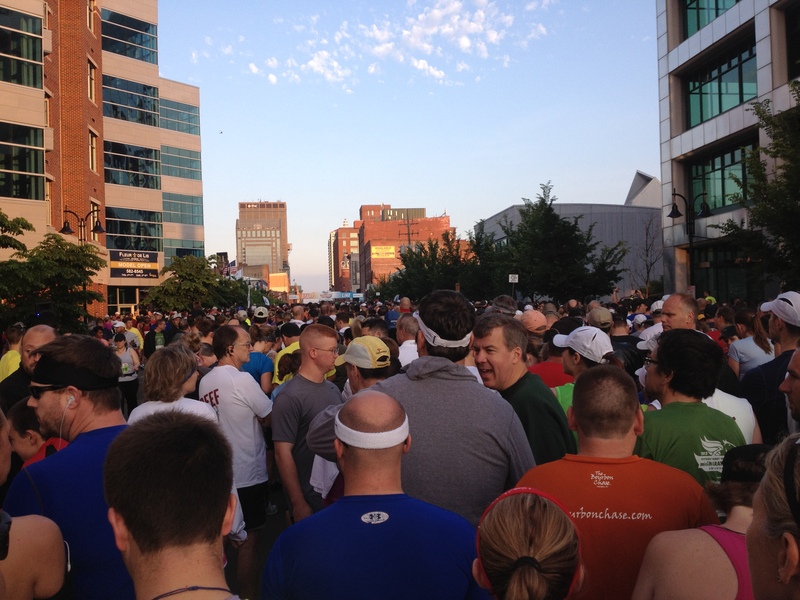 I ended up finishing with a time of 4:35:02. Definitely not a new PR but I completed a fairly hilly course. 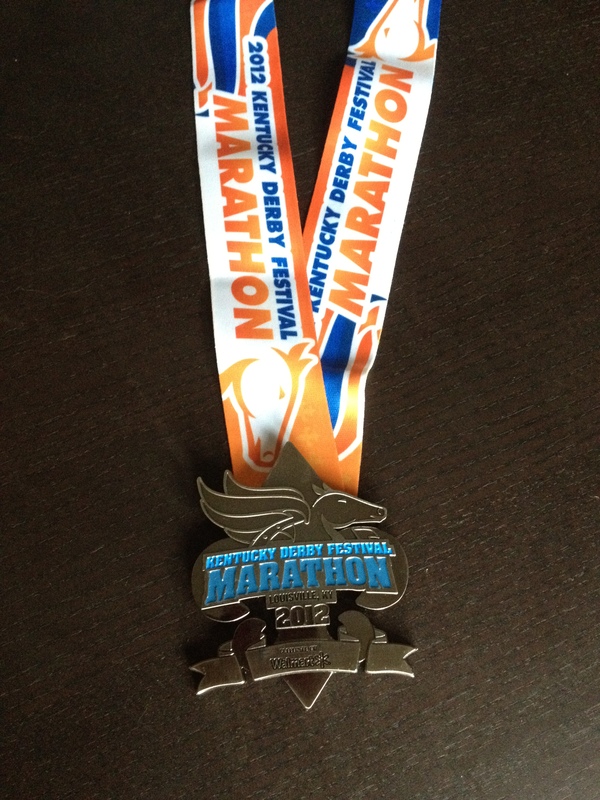 I probably won’t go back to the Kentucky Derby Festival Marathon but it was definitely an experience (and had a pretty cool medal). 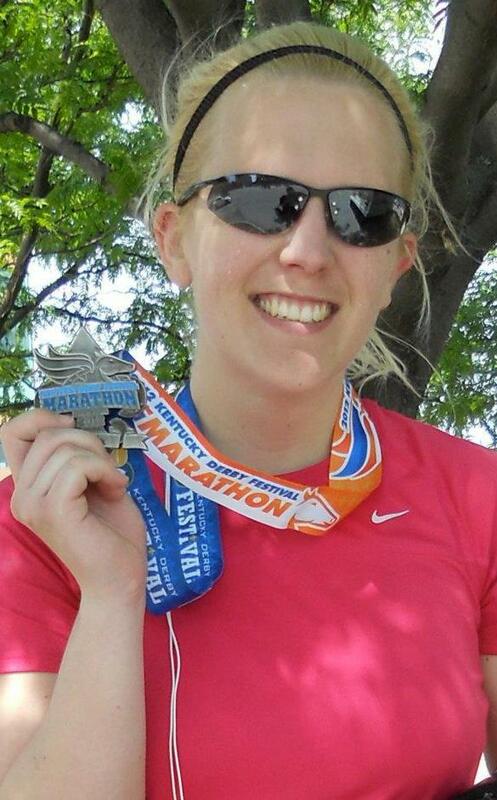 I am not sure if it is the competitive side of me that wants to do another marathon or if I am just crazy. Guess I will see at the Air Force Marathon in September.